Bob Ricks, who was the face of the FBI during the 1993 Waco siege, reflects on the 25th anniversary in an interview at his Oklahoma State Bureau of Investigation office in Oklahoma City. RNS photo by Bobby Ross Jr.
WACO, Texas (RNS) — Twenty-five years ago, Oklahoman Bob Ricks was the FBI’s main spokesman during the 51-day standoff outside Waco between federal agents and an apocalyptic religious sect known as the Branch Davidians. 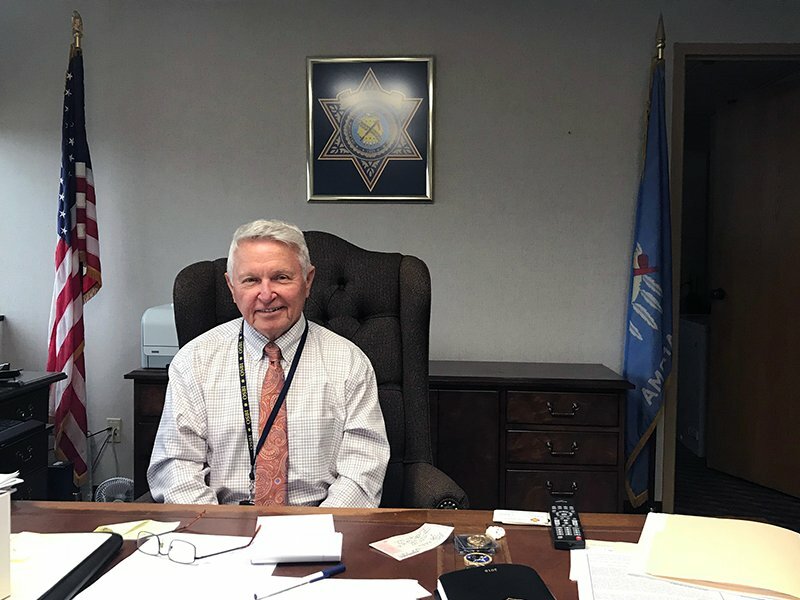 Ricks, 73, who earned his undergraduate and law degrees from Baylor University in Waco, has spent almost 50 years in law enforcement, first as an FBI special agent and later as the police chief in the Oklahoma City suburb of Edmond. Before the deadly inferno that killed Branch Davidian leader David Koresh and 75 followers on April 19, 1993, Ricks stepped to the microphone for nearly three dozen news conferences with the national media. Last year, the father of two and grandfather of five received the Salt & Light Award presented by the Christian Business Men’s Connection of Oklahoma City. He’s an active member of Henderson Hills Baptist Church in Edmond, where he taught juniors and seniors in the high school ministry for more than 10 years. As a reporter at the time for the Edmond Sun newspaper, I interviewed Ricks, then the special agent in charge of the FBI’s Oklahoma City office, in the wake of the siege. In a new interview a quarter-century later, Ricks — now director of the Oklahoma State Bureau of Investigation — was much more willing to talk about his own Southern Baptist faith as well as Koresh’s beliefs and the FBI’s handling of the tragedy. What do you remember about April 19, 1993? I remember it being a day that we were hopeful that things would be resolved. But people had different thoughts. Some still thought that these were people that would respond like criminals. Generally, most criminals say, “Aw, I’ll never be taken alive” and “I’m going to shoot it out to the death.” Then you throw the tear gas in, and they usually come out with their hands up. They know they’re going to go back and play basketball with their friends in prison. How was this situation different? I knew this was different in that a large group within that community was very much dedicated to what they were doing. They were not criminal in nature, although some of them had criminal backgrounds. A lot of them had been in there (the Branch Davidian complex) for years and were dedicated to somebody who was, unfortunately, a false prophet who they believed was Jesus Christ, the Son of God. So they pretty much had decided that they had invested their lives and their treasure and everything they had into this one gentleman, and they were willing to die for him. One criticism, which was featured in the recent Paramount Network miniseries “Waco,” is that the FBI treated this group as a cult and really didn’t understand their theology. How would you respond to that? I don’t think anybody understood their theology. We tried to get as many experts as we possibly could. But the recent miniseries was a total disaster and a total fabrication, unfortunately. When we talked 25 years ago, you emphasized that a lot of what you said at the news conferences was directed toward Koresh as much as anybody. What was your approach toward him? He had promised on different occasions to come out. But then he said God told him to wait. After the attorneys got involved, the attorneys promised that he would come out after Passover. Then the last time, he promised that he would come out after he wrote the history and his interpretation of the Seven Seals (from the Book of Revelation). But the approach to him was when he would start making a promise to come out, it was to try and encourage that. To give him some reason that he could believe, and he would have a chance at a fair trial, that his people there would be treated kindly. Then other times, he would become very belligerent. He would write letters threatening to destroy Waco — to blow up the dam, and it was going to flood Waco and kill thousands of people. His letter writings became more and more belligerent. And then he would withdraw, wouldn’t talk with us. Sometimes we would be addressing that, asking, “What can we do to get him back on the phone … and try to get him to negotiate the release of the people inside, particularly the children?” The focus was always to do everything we could to get the people out. So sometimes, there was a slight disconnect between the hostage rescue team and the negotiators in that sometimes they thought I was coddling him because I would be saying nice things about him, and of course that was all by design, because we were trying to build him up and get him to start trusting us more. But other times I was harsh toward him because the negotiators believed that it was time to try to push him to try to get him back to the table — not the table itself but hypothetically a table — to negotiate a settlement of this. So it was a back-and-forth process that we engaged. Do you feel like you understand Koresh any better 25 years later? Or can you understand him? See, I’ve never described him as a madman. I don’t think he was a madman. I think probably the best description of him is a master manipulator. I don’t believe he suffered from a true psychosis that some people tried to ascribe. Did he believe that he was Christ? I think it was to his benefit to believe that and that he was able to get his people to follow him by believing that. Once he left that persona, he had nothing. He was able to cultivate that belief among his followers, and all the power, prestige, special benefits that he got by being the so-called sinful Messiah would all dissipate if he were not. So by being this master manipulator, he was able to slowly — he didn’t do it overnight, it was over a period of years — where he actually let them proclaim him to be the Son of God. He knew exactly what he was doing, and the way that he was able to accomplish that was to show them that only the Lamb of God, only Christ, can open up the Seven Seals. And because he was able to, in effect, open them up in their eyes to describe what the Seven Seals each represented, and what the opening was, then they eventually proclaimed him to be the Son of God. How does your personal faith influence how you would look back and view the situation involving Koresh and the Branch Davidians? I cannot separate my faith from who I am. I had tremendous sympathy for the people inside, and it was crushing when we could not get them out of there. The only thing that you can do is say that at no time was there any animus by the government that was directed toward that group, and everything we did, even though it wasn’t portrayed that way, was intended to try and do everything we could to get them out of there. How would you describe what David Koresh believed? Koresh believed he had to commit every sin possible. He preached that Christ could not totally relate to the common people because he was sinless. Therefore, he could not really appreciate what ordinary people went through. So in order for him to be able to relate, he had to commit every sin that was known to man. Most Christians believe in the second coming of Jesus Christ. That’s part of our core belief as a Christian. But Koresh’s way in using their kind of misinterpretation of the Bible led to a following that is completely outside the norms of any biblical study that I’m familiar with, except for their little core group. If you could just convey that everyone was just totally crushed when this thing did not end the way that we had hoped that it would end. I had to comfort a lot of the women and others who had worked on this thing from the very beginning, people were just totally overwhelmed, people were crying, people had invested every part of their being into trying to get this thing resolved, my colleagues that had worked on this for that whole period of the standoff. And to see it come out so badly where there was so much loss, so much unnecessary loss of life, it was just overwhelming and just hard to describe. And I think most of us who got through it and tried to get through it in a healthy manner had to rely on our faith. We had to realize that horrible things do happen in this lost and fallen world, and that there are people out there who are false disciples who are leading people in the wrong way and that it’s incumbent upon us that we actually understand the Bible, understand what it does say, and not have people that want to tickle our ears and teach us false doctrine and lead us down to a road of destruction. So it gives some comfort, but there’s hardly a period of time that goes by that I don’t think about those events. Those events will be with me for the rest of my life. THANK YOU, MY BORN-AGAIN CHRISTIAN BROTHER, FOR “HORRIBLE THINGS”. Bombing was NOT in 1993 and NOT 25 years ago. 4/19/95, 23 years ago. The Oklahoma City bombing was on 4.19.95. 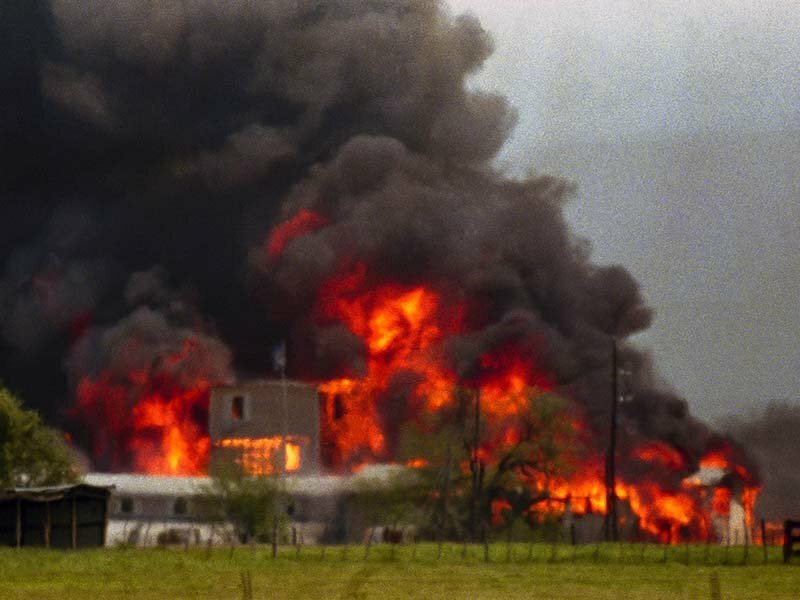 The Waco siege ended with the fire and deaths on 4.19.93. The OKC bomber acted in part out of revenge for the Waco incident. Pure murder and slaughter of innocent men women & children, by the USA government barbarians .